In a disgraceful attempt to smear the recent ASLEF strike on London’s Underground, Osborne’s Evening Standard published an attack piece yesterday that claimed pay rises were “wasted” on train drivers. The divide-and-rule tactic by the Tory PR machine, designed to create resentment from other sections of the working class, is something the Labour Party needs to be better at refuting. The presentation of this issue speaks to three of our key demands: a pay raise for all public sector workers, strong unions and a nationalised transport system. On Twitter, national executive committee member Lara McNeill hit back at the party’s response, demanding that London Labour “focus commuter anger on the bosses”. Tube train drivers staged a second 24-hour stoppage last week, and now have more branches calling for a strike ballot. The union has suggested there could be a ‘combine wide’ strike on the system if the dispute is not resolved. To better understand the reasons behind the strike, it’s worth reading this statement from ASLEF. 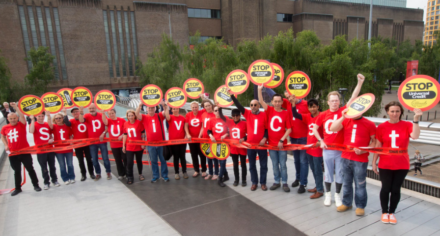 In a provocative move, Unite activists staged a protest outside the Labour Party South East regional conference demanding that Labour-controlled Southampton Council shelve plans to close its remaining care homes, threatening 80 livelihoods. The dispute has caused deep upset over budget priorities, as the council is set to spend £1m on fancy bins while they close the homes. Over at the North West regional conference, delegates raised £250 toward the strike fund for Unite’s members at Cammell Laird, who announced the result of their ballot on Friday. Workers will walk out in an attempt to save nearly 300 jobs at the Birkenhead shipyard. Len McCluskey also addressed the conference; his speech was published on LabourList. Also opposing austerity on a local level, Unison has protested the potential closure of five nurseries in Salford. Following swingeing government cuts to local authority budgets, the council there cannot guarantee funding beyond August 2019. Angela Rayner, Rebecca Long-Bailey and Salford’s directly elected mayor Paul Dennett all addressed the rally in support of the nursery workers and the families who rely on them. Hundreds of workers and activists joined a protest to parliament last week, led by Unison, demanding investment in libraries, museums and galleries. Many of them are also at risk due to local government budget cuts. The FBU has released statements condemning potential cuts to fire services in both Hertfordshire and Tyne and Wear. This appears to be a fresh attack on firefighters despite growing public concerns post-Grenfell of the lack of investment in protecting working class communities. The union also has 600 of its members involved in a court case challenging the government’s new transitional pension scheme. Similar to the challenge by a smaller group judges (which, unsurprisingly, has received a bit more coverage), the firefighters argue this new scheme discriminates on the basis of age. A really useful daily blog on FBU’s website is detailing news from the court as it happens. Another strike is on the cards, as offshore workers in GMB and Unite are demanding a 4% pay rise to reflect the rising price of oil. Thousands of them voted to walk out after rejecting successive offers from the industry contractors. Controllers at a major rail freight company DB Cargo have also voted to strike. The workers, represented by TSSA, are demanding better pay and improvement to their terms. Security workers at the University of Leicester face losing up to £1,200 a year as their hours are reduced from 37 to 35. They’ve voted to strike, but are hoping to avoid it through public pressure. You can help by signing Unison’s petition. They can hopefully be buoyed by the news that a strike by Unison at Bradford University has forced a climb down from management. Initially, 250 jobs were at risk of redundancy, but following four days of industrial action, that is now looking less likely. Finally, some good news: in a lovely lobbying win, the GMB has secured greater protections for foster carers, as the government agreed to their call to include them in bereavement leave law. Saturday 17th November – National Unity Demonstration, called as a chance to mobilise the anti-racist movements and show our strength in opposition to the growing and gregarious far-right. Many of the trade unions are involved, and Unite is offering transport to and from the protest. Saturday 1st December – a busy day, as CWU are hosting a day of action for their Save Our Post Office campaign, while Unite is running a Stop Universal Credit action day.